The rugosa roses along the Tony Knowles Coastal Trail in Anchorage Alaska are in bloom and extremely fragrant. Park at the Winchester Lagoon parking lot near the Covy Cafe. First enjoy the view of the Chugach Mountains beyond the lagoon. Then walk toward Earthquake Park on the trail. 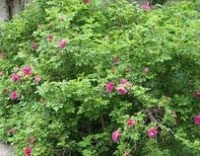 In less than a quarter of a mile you will be rewarded not only by the views of downtown Anchorage but also the scent of double-flowered rugosa roses. When you return to your car, stop at Covy Café for some coffee or ice cream. This café is operated by Covenant House Alaska for job training of youth. When choosing things to do in Anchorage, Alaska, Craig and Caroline at Camai Bed and Breakfast have even more suggestions for their guests. This entry was posted in Uncategorized and tagged Coastal Trail, flowers by admin. Bookmark the permalink.